We're teaming up with Squarespace to get to know a few of our favorite bloggers a little bit better. Join us as they share their tips, tricks, and, of course, recipes -- and make sure to keep up with the series for a chance to win a yearlong subscription with Squarespace (scroll down for a code to get 10% off)! Today: We're chatting with Lindsey Love of Dolly and Oatmeal about what it's like to write a blog focused on specialty diets -- and why more and more people are following suit. The idea of "healthy eating" can be a polarizing concept, met with anything from skepticism to zeal to outright rejection. In a world where people tend to gravitate towards extremes, it can be difficult to eat with balance and purpose. Thankfully, Lindsey Love of Dolly and Oatmeal is here to help inspire us. 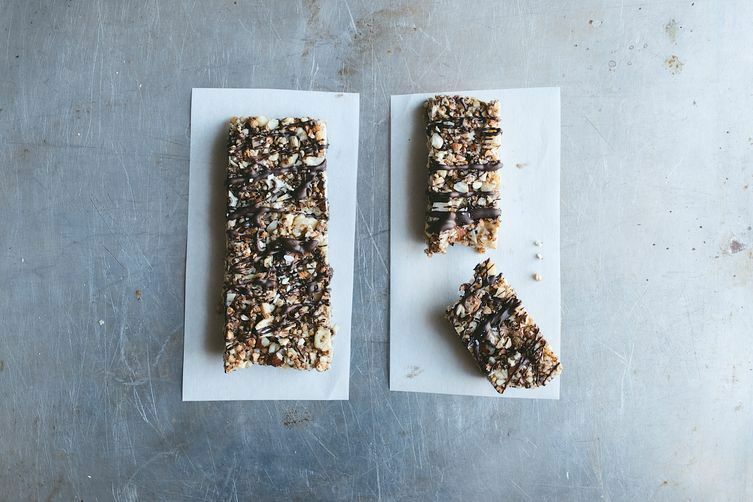 Lindsey has no problem admitting that her blog focuses on healthy eating. However, unlike some of her contemporaries, she isn't out there to spread guilt or preach asceticism in the kitchen -- in fact, quite the opposite. When you click on her blog, you're struck not only with stunning photos of colorful salads, crisp vegetables, and green soups, but also of cookies, cakes, and chocolate-drizzled sweets. Though all of Lindsey's recipes are gluten- and dairy-free, they don't feel as if they're lacking. Her core belief is that if you eat well, you'll feel good. It's simple, yet beautiful; much like the website itself. 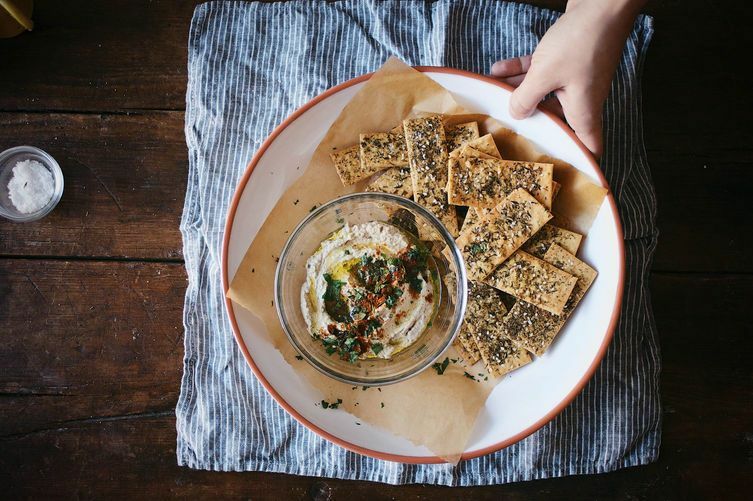 Read on to learn about Lindsey's journey into food blogging and why she thinks more and more people are writing about specialty diets -- plus get her recipe for Za'atar-Spiced Chickpea Crackers. What influenced your decision to start a food blog focused on healthy, wholesome eating? My blog started out as a personal journey to find, source, and create food that was nourishing and wholesome, but also tasted really good. I have had a long, sometimes painful, relationship with food, so starting the blog was a way for me to try to help others avoid some of the difficulties I experienced. There is a direct correlation between the food we eat and our emotional and physical well-being, and that's the message I'm trying to spread. You've had a complicated relationship with food, eventually realizing you were sensitive to dairy and gluten. Did this discovery jump-start your interest in cooking and blogging, or were those passions always there? I’ve always known I was sensitive to dairy products, but growing up I ignored and excused the ill effects they had on me. It wasn’t until I stopped by a nutritionist’s office for some much-needed guidance that I realized my consumption of gluten was a huge contributor to my bad moods, weight gain, and overall cloudiness. After this discovery, I started eating differently; and about a year later I started a blog focused on healthy eating. I've always had a passionate interest in the relationship between food and quality of life, and I think this was the main driving force behind the creation of my blog. Is it challenging to make healthy foods appealing, in a world where people often gravitate to food that is over-the-top? Yes and no. The wonderful thing about blogging is that it really creates an atmosphere of attainability for the reader. My template on Squarespace, Supply, has also been really helpful -- it makes it easy for me to achieve a clear structure and flow, which enables my readers to navigate the blog more efficiently. The kind of friendly atmosphere it helps create is especially important for blogs dedicated towards promoting a healthier lifestyle, because they show the public that healthier foods are totally within their reach. They’re made in a kitchen just like yours or mine where there are no professional chefs or fancy tools -- just you and the food. Of course most people, me included, have a soft spot for sweets and junk food, so it can sometimes be difficult to convince someone to choose a veggie burger over a double bacon cheeseburger. In my opinion, balance is truly key -- there’s a yin and a yang to it all. More: Another healthy version of a classic junk food? These baked potato chips with yogurt dip. The number of food blogs focused on gluten-free, dairy-free, and similar diets has skyrocketed recently. Any idea on why this might be? Unfortunately, I think the rise in blogs focused on specialty diets has increased in proportion to the amount of people who are realizing they are sensitive to things like wheat, gluten, and dairy products. Really, it comes down to the fact that these kinds of blogs and diets are popping up so often because people are becoming more and more aware of these sensitivities, in general. I would also like to think that individuals are more and more dissatisfied by what’s put out there by big agriculture and large-scale food corporations who make products with all sorts of fillers and preservatives. Seeking alternatives -- by way of altering one’s diet or buying fresh produce -- is a means of expressing this dissatisfaction. How has blogging changed your relationship with cooking? I would say my cooking and baking is more intentional now that I try to highlight fresh, seasonal produce as often as possible. I make a concerted effort to buy from local farmers markets where the produce is glistening and raw, and can sometimes even be less expensive than what they offer at my local grocer. My cooking is also more intentional in the sense that I now pay attention to what the months and seasons are offering. It’s a bit cheesy, but since starting this blog I’ve begun to feel an increased sense of connectedness to nature, and more respect towards the seasons. This article was brought to you by Squarespace! Enter code FOOD52 for 10% off a yearlong subscription. Such a beautiful blog. And such inspiration. Another great food blog! Looking forward to trying this recipe. The only thing I've made with chickpea flour is socca - psyched for another. Thanks for the blog in general. I work with a lot of people with autoimmune diseases and it's always great to have a new resource to share with them. Loved this interview! Love Lindsey's creative take on food - full of flavour, never boring and with a side of healthy. And the photos, so inspiring! Your blog is so lovely Lindsey! Gorgeous clean images. I use squarespace too. So handy for the time poor blogger. can't wait to make these crackers! love this blog. Right back atcha, lovely lady. xo! That means so much, Lyndsay! xoxo! Lindsey is one of the most inspiring new bloggers out there. Her recipes are innovative and healthy without being boring or lacking taste, her writing is thoughtful, and her photography never ceases to amaze me. Loved to read this interview! Sini, you are way too kind. Lots of hugs to you, lovely. Great interview! So great that you were able to turn a disadvantage--the food allergy--into something so productive that benefits so many.